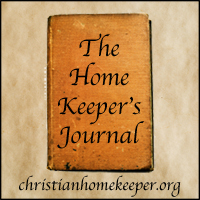 This week the Homekeeper’s Journal is about Spring Time Changes. In My Kitchen This Week … spinach salad with red onions, pork roast and baked potatoes, ice cream from Cold Stone Creamery (a treat!). Eating more meals outside in the nice weather. Changes I Make To My Home In Spring … repotting the houseplants, cleaning out the corners, washing and putting away the extra blankets. Changes In My Schedule … feeding the animals earlier, before the people; staying in the workshop later; having more homeschool lessons outdoors. Changes In My Yard/Homestead … putting in a gate to get into the chicken yard; replacing gate to goat pen; mixing up the compost pile. What I Look Forward to This Spring … sunshine and warm days; opening the windows; lighter layers of clothing. Spring Brings with It … pollen and sinus activity; new grass for the critters; bugs. A Sure Sign Of Spring … juniper berries popping and making noses run and eyes itch; ruffly, lacy Easter dresses; pansies at the nursery. A Favorite Spring Activity … taking a morning walk; dozing in the lawn chair; putting a line in the water at the lake and claiming that I’m fishing. Your salad sounds delicious! Very cold here today. Thank you for adding me, I will do the same!